This story was updated at 11:55 p.m. ET. The recent announcementthat just a smidge more matter than antimatter was created during eight yearsof atom-smashing by a particle accelerator in Illinois is an encouraging stepfor scientists trying to figure out the universe around us. But researchers stillhave a tough job ahead to determine if what they saw is enough to explain thecold, hard fact that today's universe actually exists. The balance between certainmatter and antimatter particles tipped toward normal matter by just 1percent during the particle-smashing run at the 4-mile Tevatron collider at theDepartment of Energy's Fermi National Accelerator Laboratory (Fermilab) inBatavia, Ill. It's highly unlikely that the 1 percent came about due to chance,according to statistical analysis, researchers said. "We know that what wemeasured is more than what was previously known," said StefanSoldner-Rembold, a physicist at the University of Manchester in the UnitedKingdom. "Whether this is now sufficient to explain cosmological models,well, that's something theorists have to calculate." Physicists have longsuspected that something tilted the balance in favor of matter overantimatter, despite the original universe starting with equal amounts ofboth in theory. Yet the Standard Model of particle physics barely allows forany matter-antimatter asymmetry or imbalance — certainly not enough to giverise to today's universe. "We know there's thisasymmetry in the Standard Model, but for the quantity measured it's reallynegligibly small," Stefan Soldner-Rembold explained. 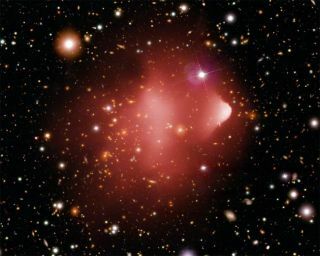 By the same token, any biggerimbalance discovered between matter and antimatter "would be due to somenew effect," Soldner-Rembold told SPACE.com. The research team workingon Fermilab's DZero experiment hopes that their new finding might be enough to explain how matter won out. The idea that antimatteracts as the mirror image of matter is known as charge-parity (CP) symmetry. Butscientists had already found a few instances in the past where slightbehavioral differences lead to changes in the overall balance of matter andantimatter particles. A first clue about thepossibility of breaking the rules of CP symmetry came during an experiment in1964, when physicists found differences in the decay of particles called kaonsand their anti-kaon counterparts. Past experiments have also measured B mesons,but not in the same way as the latest study at the Tevatron collider. For now,scientists can draw encouragement from having taken a step closer to findingdefinitive proof of how matter won the battleagainst antimatter. "It gives morecredence [to a theory] if you have more than one hint pointing in the samedirection," Soldner-Rembold noted. Finding even the 1 percentdifference represented a tricky task. First, it required theTevatron collider, which can create antiparticles that might otherwise onlyarise from rare events such as nuclear reactions or cosmic rays from dying stars.That allows physicists to study high-energy collisions between matter andantimatter particles, such as protons and antiprotons. A collision between protonsand antiprotons creates the B meson particle and its antimatter twin. Thoseheavy, short-lived particles then decay almost immediately into pairs ofparticles known as muons, as well as their antimatter counterparts known asantimuons. The scientists gauged thenumbers of positively-charged muons and negatively-charged antimuons bywatching which way the particle paths curved as they zoomed between a pair ofmagnetic fields. The research team also reversed the magnetic fields every twoweeks, to make sure that no slight differences among the detector parts skewedtheir calculations. "When you perform anexperiment, you have to be really sure these background differences are small,"Soldner-Rembold said. By ruling out the backgrounddifferences, physicists showed that the chance of their finding beingconsistent with a known effect is below 0.1 percent. That represents perhapsthe strongest evidence yet of how differences in the behavior of matter versusantimatter can tip the scales. POLL: Will Scientists Unravel the Universe's Matter-Antimatter Mystery?